Here are some preliminary results for applying these textual analysis techniques to log data. Somewhat surprisingly, with English prose the measures of resemblance, containment, and Dice's coefficient were of little use but the vector space model worked reasonably well. The opposite is true with the syslog data. The vector space model was of little use, its results are not shown here. 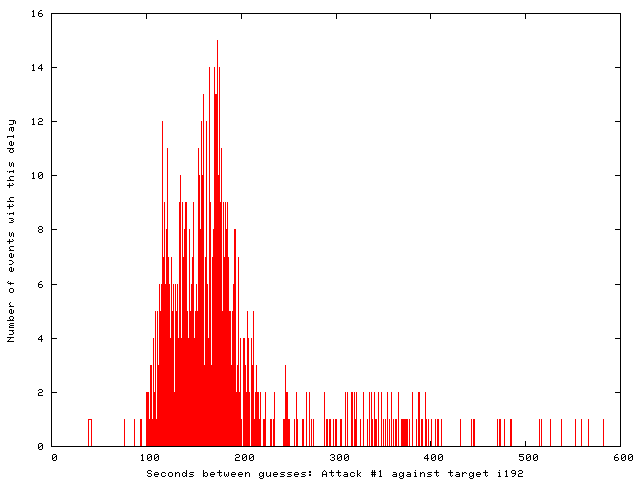 A collection of log data was selected, including 15 attack sequences from 6 attacking hosts. Picking an arbitrary threshold of 0.3, the values colored in green in the following tables show correct classification of similar attack form, while values in yellow show errors — within-source measures below the cutoff (false-negative error) or between-source measures above it (false-positive error). Resemblance and Dice's coefficient seem most useful. Dice's coefficient performed slightly better on this data set. The containment measure was less useful due to false-positive matches, as might be expected. Small sequences (e.g., H and I) are contained within large sequences (D, J, K, L, and N in this case). Values below the diagonal, as the tables are symmetric. Measures between identical sequences J and K.
and the true negative matches of interest are the remaining 80 pairs. The thresholds could be adjusted to optimize the error rates for the resemblance and Dice's coefficient classification. Study of the tables shows the following performances with varying thresholds. The maximum total correct classifications and the crossover points are highlighted. The first problem that comes to mind is the computational complexity of applying this to large collections of attack sequences. The eventual goal would be to answer for a newly observed sequence, Does this sequence strongly resemble anything seen so far? That would require an approach based on a feature vector, so the only new computation would be the calculation of the new feature vector and a comparison to an existing catalog of observed attack signatures. Analysis using the other inter-document similarity measures would require calculation growing with the size of the existing data collection. An unexpected problem arose when applying this this same sort of sequence extraction and analysis to a new month's data. That data included an attack by a botnet of 707 hosts in which only guesses for the root password were attempted. Typical guesses were separated by 20 to 80 seconds from the one before. With two exceptions, no botnet members made two consecutive guesses. 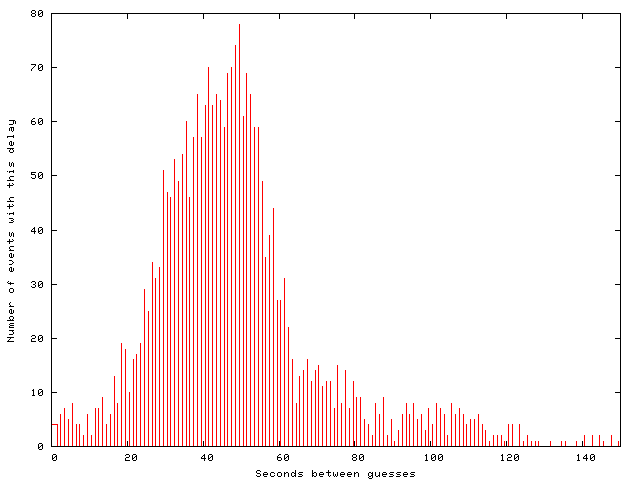 A gnuplot histogram of the inter-guess times shows the distribution. Click here to see the list of botnet members and the inter-attack timing. immediately suggesting that this was a botnet, all the members running C code compiled against the libssh API. However, once the hosts attempt host-to-host authentication (which, of course, fails in this case) and then negotiate ciphers and a session key, you see nothing else useful in the raw network traffic. The trick is to attach to the SSH server process with strace and observe the I/O at the application level. and look for the PID of the process marked LISTEN. This page claims to list "The Top 500 Worst Passwords of All Time", but there is no explanation of where they got that data. Since admin isn't even on the list despite being the default password on lots of network gear, I don't think the list is very authoritative. But it's kind of interesting. Comparing the 200.213.105.90->i192 sequence to the sequences from the attack from 85.114.130.49, in Germany, on June 1, we see that they are basically the same sequences. The differences are early termination plus deletion of a few entries mid-list, probably due to timeouts during that attack. That 200.213.105.90->i192 sequence is the most complete version of this list seen in two attack sequences widely separated in time and space, click here to see that list. Users usually aren't assigned identities like those, but they are the sorts of passwords users would prefer! Also recall that the target hosts are shown here as the first letter of the host name followed by a 3-digit representation of the last octet of the IP address. The first attack sequence started in numerical order if we disregard one entry transposed by one position, suggesting that the attacks were driven by a list or range of IP addresses or a CIDR representation. That makes sense, as none of the hosts are public web servers or other prominent hosts. The starting order of the second attack makes less sense, as the target hosts are ordered by neither host name nor IP address. The organization's DNS servers do not allow zone transfers, so an attacker could not have obtained a list of host names that way. Also, some of the systems involved are used only as servers, and so they would not have shown up as clients in some web server's logs. The only thing that really makes sense is for these attacks to have been controlled by ranges of IP addresses. The timing between the starts of the individual sequences also varied between the two attacks. Maybe the order and start times were randomized by the attack software. A similar attack from a larger botnet was seen when analyzing data from two servers at a web hosting company. These attacks show the impracticality of purely automated analysis. My analysis script can generate an HTML file describing a month's probes against a system. But the file grows proportionally when one botnet attack appears to be hundreds of one-guess attacks. What had been an HTML file of a few hundred kilobytes grows into the tens of megabytes with the addition of all those tables. It seems that human judgement is needed to tell the difference between an unaggressive botnet and random one-guess attacks. More difficult yet is the situation where a more aggressive single-attacker sequence happens to fall in the middle of a botnet attack. Several did, in this case, but they were spotted by seeing how many consecutive guesses were made by each host. This can be done with use of a simple uniq | sort -n command sequence. Given an average inter-guess timing in the tens of seconds for the botnet versus two to four seconds for a typical single host, the non-botnet hosts stood out and could be removed from consideration. Motivated to look for signs of botnets, two more attacks were spotted against other hosts during that same month! Those attacks seem to have been perpetrated by the same botnet, as there is a large overlap in their member hosts. The attacks were rather different than those of the first botnet, as they attempted guesses for a number of accounts in addition to root. 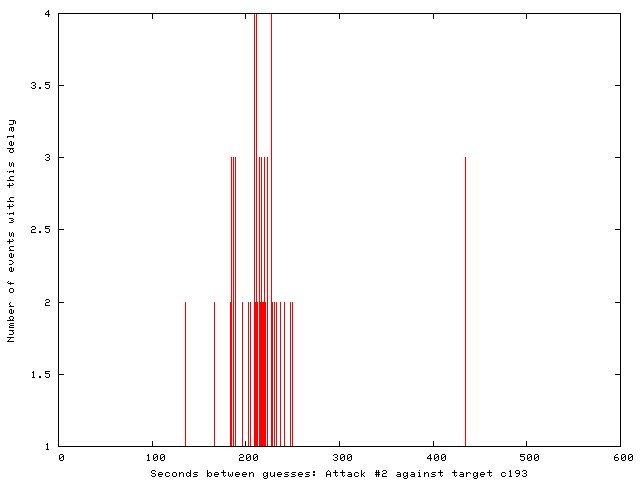 Comparing the sets of attacking hosts (the botnet members), 94 were seen in both attack sequences. As seen in this table, the distribution of activity varied between the two attacks. The numbers in the table record the number of password guesses, individual attacks or probes, and does not necessarily reflect the number of unique botnet members in that country. Some stereotypes are reinforced in that table: the high rankings of the U.S. and Europe. Others are dashed: the surprisingly low rankings of China, Hong Kong, and Japan. Within each of the two attacks, the distributions of probe sources seen on the two target hosts were almost identical. The slight differences were probably due to timeouts leading to abandoned attempts. 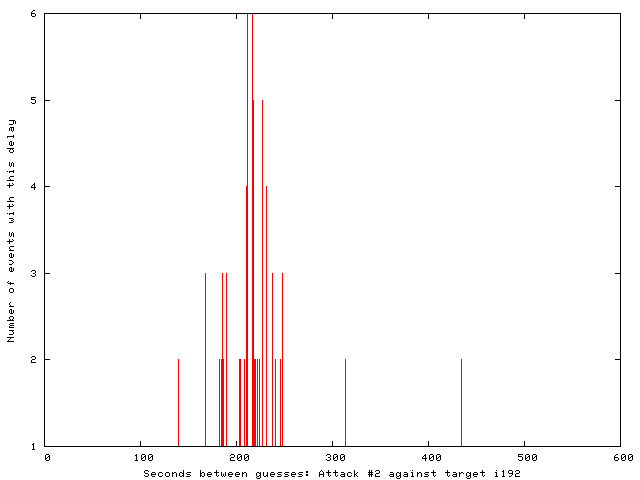 The timing was less aggressive in these smaller attacks, as shown by the inter-attack timing histograms below. Attacks in the first and second sequences were spaced by 100-200 seconds and about 200 seconds, respectively. set xlabel "Seconds between guesses"
set ylabel "Number of events with this delay"
"Entropy estimation of symbol sequences"
"We discuss algorithms for estimating the Shannon entropy h of finite symbol sequences with long range correlations. In particular, we consider algorithms which estimate h from the code lengths produced by some compression algorithm. Our interest is in describing their convergence with sequence length, assuming no limits for the space and time complexities of the compression algorithms. A scaling law is proposed for extrapolation from finite sample lengths. This is applied to sequences of dynamical systems in non-trivial chaotic regimes, a 1-D cellular automaton, and to written English texts." "Syntactic Clustering of the Web"
"We have developed an efficient way to determine the syntactic similarity of files and have applied it to every document on the World Wide Web. Using this mechanism, we built a clustering of all the documents that are syntactically similar. Possible applications include a "Lost and Found" service, filtering the results of Web searches, updating widely distributed web-pages, and identifying violations of intellectual property rights." "Finding Similar Files in a Large File System"
"We present a tool, called sif, for finding all similar files in a large file system. Files are considered similar if they have significant number of common pieces, even if they are very different otherwise. For example, one file may be contained, possibly with some changes, in another file, of a file may be a reorganization of another file. [....]"
"Clustering and Categorization Applied to Cryptanalysis"
A nice discussion of a generalized clustering approach and its application to cryptanalysis. "Stylistic Text Classification Using Functional Lexical Features"
"Most text analysis and retrieval work to date has focused on the topic of a text; that is, what it is about. However, a text also contains much useful information in its style, or how it is written. This includes information about its author, its purpose, feelings it is meant to evoke, and more. This article develops a new type of lexical feature for use in stylistic text classification, based on taxonomies of various semantic functions of certain choice words or phrases. We demonstrate the usefulness of such features for the stylistic text classification tasks of determining author identity and nationality, the gender of literary characters, a text's sentiment (positive/negative evaluation), and the rhetorical character of scientific journal articles. [....]"
"Evaluating Internet Resources: Identity, Affiliation, and Cognitive Authority in a Networked World"
J. W. Fritch and R. L. Cromwell (yes, that's me), JASIST (Journal of the American Society of Information Science and Technology), vol. 52, no. 6 (2001), pp 499-507. "Gender, Genre, and Writing Style in Formal Written Texts", Argamon, Koppel, Fine, and Shimony, Text, 23(3), 321-346, 2003. "Outside the Cave of Shadows: Using Syntactic Annotation to Enhance Authorship Attribution", Baayen, Halteren, and Tweedie, Literary and Linguistic Computing, 7, 91-109, 1996. "Computation into Criticism: A Study of Jane Austen's Novels and an Experiment in Method", J.F. Burrows, Clarendon Press, Oxford, England, 1987. "Language and Gender Author Cohort Analysis of E-mail for Computer Forensics", de Vel, Corney, Anderson, and Mohay, in Proceedings of the Digital Forensic Research Workshop, Syracuse, NY, pp 7-9, 2002. "Visualization of Literary Style", Kjell and Frieder, in Proceedings of the IEEE International Conference on Systems, Man, and Cybernetics, Chicago, IL, pp 656-661, 1992. "Authorship Studies/Textual Statistics", McEnery and Oakes, in Handbook of Natural Language Processing, Dale, Moisl, and Somers, editors, Dekker, Philadelphia, 2000. "Inference and Disputed Authorship: The Federalist", Mosteller and Wallace, Addison-Wesley, Reading MA, 1964. "Automatic Text Categorization in Terms of Genre, Author," Stamatatos, Fakotakis, and Kokkinakis, Computational Linguistics, 26(4), pp 471-495, 2000. "A Probabilistic Similarity Metric for Medline Records: A Model for Author Name Disambiguation", Torvik, Weeb, Swanson, and Smalheiser, Journal of the American Society for Information Science and Technology, 56(2), pp 140-158, 2005.